The government has signalled it understands the need for more funding to help the UK develop its offshore wind industry, but with onshore wind an established, secure source of power, it needs to consider fully the ramifications of cutting subsidies. Research conducted by EU Skills shows that almost 45,000 jobs could be created in offshore wind over the next ten years, but there could also be more than 37,000 created across onshore. To this effect, the government needs to support both to ensure the industry grows at the required rate. Onshore wind is a better-known technology with a track record of success, and presents a better risk/reward ratio to investors – it offsets the cost of deep-water construction, which is still not seen as a viable option. 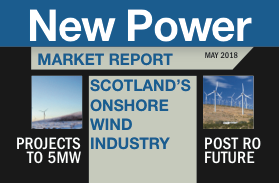 Currently 4,500 MW of onshore wind capacity, enough to supply power to three million homes, could be put at risk if investors are forced to recalculate finances following the budget announcement. If support for onshore wind is cut, we gamble with an integral part of our overall energy security policy. The question has to be asked, if we lose the generating capacity to supply three million homes through wind, what will step in to fill that gap? It would take billions of cubic meters of gas each year to replace lost capacity. In turn, this could have a huge environmental impact, heavily denting the UK’s long-term commitment to achieving 15 per cent power generation from renewable sources by 2020. With RWE nPower recently pulling out of the Atlantic Array project, sustained support for both onshore and offshore projects is now more important than ever, if we are to make them both attractive prospects for investors. Both areas require enough support to allow growth in the renewables sector. The recent subsidy changes will have a negative impact on the large increase in employment numbers in the sector predicted over the next 10 years, recently captured in EU Skills’ + Renewable UK ‘Working for a Green Britain & Northern Ireland 2013-23’ research report. It shows how the industry has expanded and can support an ever-increasing number of workers, while boosting the economy as a whole. Not only that, the increase in strike price for offshore wind will help investors move from planning into construction, creating offshore jobs, however, at the same time this could jeopardise onshore employment at the same time – a case in point for the need to maintain funding here. If there is to be growth in the offshore job market, then it is important to ensure that people have the skills to be able to perform in the industry. Through the Employer Ownership of Skills (EOS) pilot and the Employer Investment Fund (EIF), the government has enabled EU Skills to work with employers to guarantee a stream of top quality people are entering the sector. These subsidy changes stand to benefit one area of the renewables market, by making it easier for companies to set up wind farms offshore and staff them with appropriate individuals. However, the subsidies could affect the onshore jobs market if companies are forced to send their funding elsewhere. Instead, the government needs to clarify what it intends to do to support the future of the entire wind industry and the rest of the renewables market as a whole. Sarah Johnson, head of renewables, National Skills Academy for Power.